SHEONE-We are the expert grade of Manufacturer! SHEONE,specializing in down /feather bedding products with 20 years of experience.Serving mainly for USA,European and Japan Market.Honor and Certification: ISO9001:2008,ISO14001,OEKO-TEX standard,IDFL,BSCI,ect.SHEONE,one of the biggest manufacturer who are specializing in down /feather filling bedding products.our main products include down & feather filled comforter,pillow,cushion,mattress topper,mattress protector,bedding sheet,bedding cover,decorative cushion cover etc. We are the young members of Amazon,but we are the professional manufacturer of down/feather bedding products.SHEONE Team promise will supply the best quality goods according to market which you want.Welcome to join us,you make choice,we make quality! Down and feather-filled products are packed tightly(vacuumize) during shipping. Upon receipt, remove them from their packaging, fluff gently, and allow several hours to recover their full loft. In addition, being sealed in plastic packaging sometimes causes the scent of these natural products to concentrate to a disagreeable level. A few hours of airing usually removes the odor. 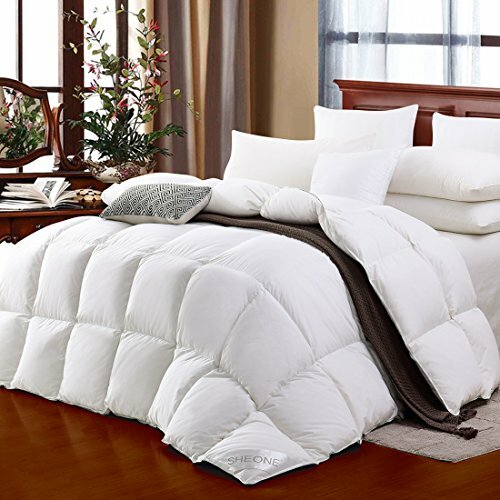 Super Fluffy:650 + fill power,Fill: White Goose Down,215gsm filled,Fill Weight: 47 oz,Comforter Shell:100% cotton fabric Leak-proof cover,Color: White,Size: King, Dimensions: 106 inch x 90 inch. Easy Care: Comforter only needs to be cleaned every 3-5 years; due to the size of the comforter, we recommend having it dry-cleaned or professionally laundered. Made reached USA Federal health disinfection standard,American down and feather testing standard,IDFL, downpass,BSCI,OEKO-TEX® standard 100(You can Scan QR code on the picture),10-Year Limited Manufacturer's Warranty.